I had to search on top of the cupboards, under the beds, in my pockets and out of the windows, to look for the lost motivation to study for the past two weeks or so, all right, make it three. The almighty driving force that pushes you to read lines faster than you ever thought you could, consolidate information in your mind more concretely than you ever thought you could, and most importantly, spring your fingers at lightning speed over the keyboard to complete a report within the shortest amount of time which you never thought was possible. The legendary “motivation” had slipped through my fingers and escaped to the unknown lands. 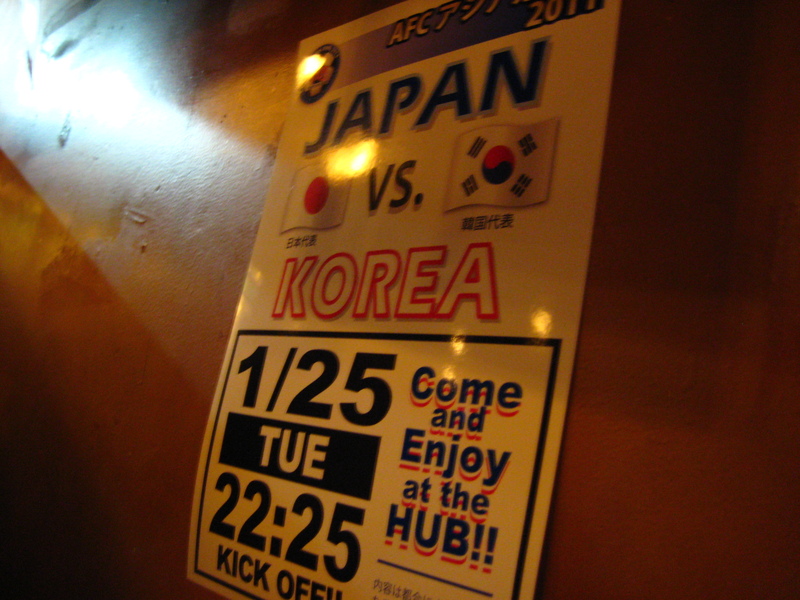 It was the Asian Cup semi-finals yesterday between Japan and Korea. Having long lost the “motivation”, my friends and I decided to go to the hub (a British pub) to watch the match between the two bitter rivals, probably not just in football. I headed to the hub with the faintest of hope that the adrenaline gained through the match could pump some fresh blood and motivation for me to complete whatever work left for the semester. I arrived at the hub with two Japanese friends, surprised to see the hub filled with throngs of people- Japanese and non-Japanese. In the mist of the crowds, I heard someone called my name and as I looked over the shoulders in the way, I found some familiar faces. They were a group of Korean friends, one of whom was having her birthday that day. Not a very good place to celebrate her birthday, I thought, as I scanned the surroundings and realized they were the only Koreans amongst the avid Japanese fans. As soon as the match kicked off, all eyes were fixed to the multiple screens around the pub, as screams and shouts cross-fired with every decision made by the Saudi-Arabian referee in the match. The first goal came to Korea from the penalty spot, as the Japanese fans sweared in disgust. My group of Korean friends had to restrain their overwhelming joys when Ki Sung Yong slotted the ball in from the penalty spot. The pulsating match went on, with the Japanese team grabbing their equalizing goal before halftime. At half-time, I got a seat right under the biggest screen, and since I had to strain my neck to watch from beneath the screen, I had the other option of looking at the other smaller screens around the pub. The interesting thing was, since the screen above mine was the biggest in the pub, everyone else were looking in my direction. It was almost amusing to watch their facial expressions twist and turn with every sliding tackle, nutmeg and shot at goal. As the match proceeded into the second half, the ardent fans started cheering and clapping. The match ended with the scoreline 1-1 after 90 minutes and had to carry on through extra-time. Japan got their winning goal in the 97th minute, but Korea grabbed themselves a lifeline when they scored the equalizer with the clock ticking down to Japan’s victory. The game went into penalties. Eventually, it was the goalkeeper Kawashima who single-handedly brought Japan to the finals as he saved two penalties, with the third one sent to the right of the post. 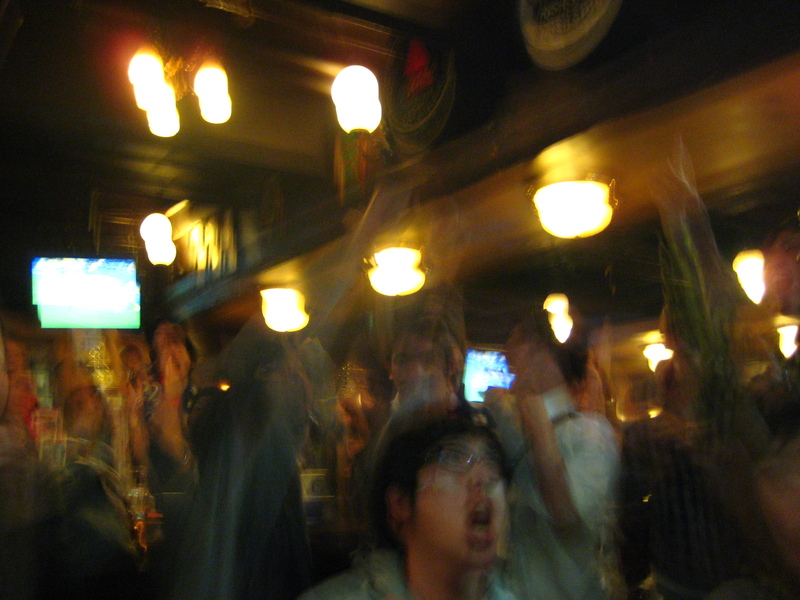 The whole pub burst into raptures as Japan survived the late scare and dramatic contest. It was a happy day for Japan, as I opened my mixi account to see my friends commenting about Kawashima’s heroics and congratulating Japan’s victory. On the other hand, I was just left wondering how my Korean friend felt on her 23rd birthday.